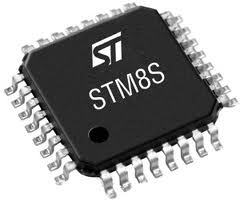 In March, 2009 STMicroelectronics introduced the STM8S family of 8-bit MCUs. Built on a proprietary 130nm process, these 2.95 – 5.5V Vdd devices achieved maximum performance of 20 MIPS. Executing from Flash, power consumption can exceed 11 mA. Built on the same 130nm process, but with Vdd scaled down to 1.65 – 3.6V, the new STM8L is designed to meet the needs of long-life battery applications and for “Green” products. There are multiple power-saving modes allowing the new STM8L family to operate in a low-power run mode consuming only 5.4 uA. As with previous families, the STM8L is offered in multiple flavors. The STM8L101 kicks off the cost-optimized, small footprint product line. These 5 devices have the standard assortment of timers, comparators, USART, SPI and I2C that designers have come to expect. Flash is either 4 KB or 8 KB with additional 1.5 KB of RAM. There is a separate 2 KB EEPROM for Data Storage. Low power comes with the tradeoff of lower performance – a maximum of 16 MIPS when running at 16 MHz. The STM8L151 variations comprise the larger memory, full-featured peripheral devices. In addition to the STM8L101 peripherals, these 6 devices also have RTC, ADC and DAC. Flash is either 16 KB or 32 KB with 2 KB RAM and 1KB EEPROM. These are built on the same core running at maximum 16 MHz for 16 MIPS performance. Coming in 2010 is the STM8L152 which will add an integrated LCD controller to the STM8L151 devices. Two features worth mentioning are a beeper function used to generate a beep signal in the range of 1, 2 or 4 kHz and an infrared interface which can be used with an IR LED for remote control functions. STMicroelectronics continues to make hardware development easier by maintaining pin to pin compatibility across all STM8L devices of the same package type. For development, the largest memory parts can be used. Once the features and code is locked down, a lower-cost option may be used in production. The STM8L family, coupled with the existing STM32 ARM portfolio, provides a wide continuum of low-cost, low-power, feature-rich devices for designers to choose from. Pricing is $0.68 for 10 K EAU on the STML101F2U (4KB, QNF20 3x3mm).